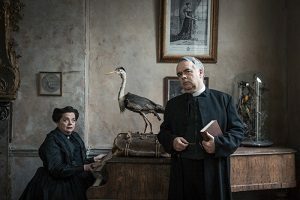 To Hell in a Handbag: The Secret Lives of Canon Chasuble and Miss Prism. While others are preoccupied with cucumber sandwiches and railway cloakrooms, two minor characters from The Importance of Being Earnest are up to their necks in something else. A country rector and a governess, models of Victorian propriety in public. But in private? This is the play behind the play: a tale of blackmail, false identity … and money. A subversively funny new take on an Irish theatrical classic. “To Hell in a Handbag is a delight – beautifully written and acted with exquisite comic timing.” Daily Mail.